2 policemen were injured as they tried to stop the car at the barricade. Even as the cops tried to physically hold the car back, the accused muscled his way through. 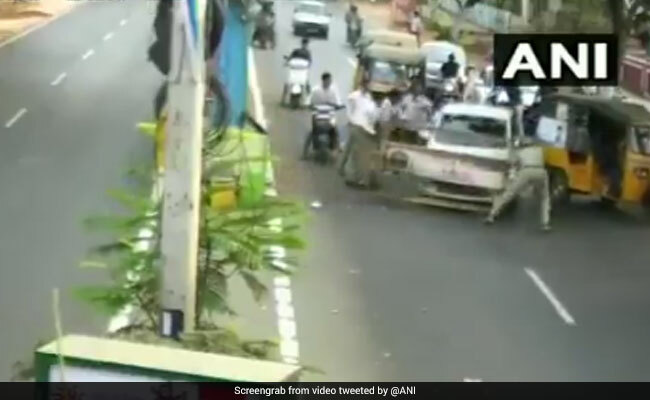 Kakinada, Andhra Pradesh: For traffic policemen in Andhra Pradesh's Kakinada, it was a regular Sunday morning - checking vehicles for traffic violations, and handing them fines - till a white Maruti Celerio came along. Even as the cops tried to physically hold the car back, the accused muscled his way through. One cop tried to pull a barricade in front of the car but the driver didn't stop. The policeman was run over in the process. He, along with another policeman, received injuries. The accused was later arrested, news agency ANI reported. Officers say traffic police personnel often end up putting their lives at risk to force motorists to stop due to the absence of a credible, updated database of motor vehicles and strict compliance of laws about vehicle registration plates. That most transport departments of states have worked in silos also hasn't helped. If the police constable is confident that there is a way to easily trace a motor vehicle, a police officer said, chances were that they would be less likely to put their lives at risk to physically stop a vehicle. A traffic constable in the national capital was run over by a truck last year when the policemen in east Delhi tried to stop the vehicle. The truck driver, however, crashed through the barricade. Constable Vignesh had died on the spot. Police later said the truck had a broken number plate and had tried to identify the vehicle from CCTV footage.